Speaking at a joint conference during a visit to the US, Mr Abe added that Mr Trump had also assured him that he was committed to "further enforcing our alliance". During his election campaign, Mr Trump said US defence commitments to Japan and South Korea were unfair and also called for Japan to pay the full cost of stationing US troops on its soil. Image caption Donald Trump said that the US "stands behind Japan 100%"
North Korea has conducted a number of nuclear and missile tests in the past year that continue to alarm and anger the region. The tests are in contravention of UN resolutions designed to curb the North's nuclear activities. Sunday's launch took place at 07:55 local time (22:55 GMT Saturday) from the Banghyon air base in North Pyongan province on the west side of the Korean peninsula. 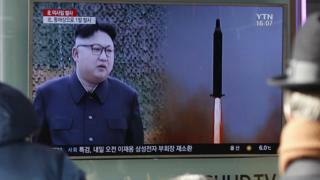 The missile reached an altitude of about 550km (350 miles), the South Korean military said. The military said it appeared to be a Musudan intermediate-range missile, capable of flying up to 4,000km and reaching the US territory of Guam in the Pacific Ocean. Mr Trump derided the claim in a tweet, saying: "It won't happen." Japan's Chief Cabinet Secretary Yoshihide Suga confirmed the missile had not reached Japanese territorial waters, adding that Tokyo would make a "strong protest" to North Korea over the incident. On a visit to South Korea last week, US Defence Secretary James Mattis said that any use of nuclear weapons by North Korea would be met with an "effective and overwhelming" response. Donald Trump tells close ally to "focus on terrorism" after she criticised his far-right retweets. Has the US forgotten about World War One? Why is Britain First big online? Can you get paid to move to the Alps?